Since we didn’t really eat all that much our first day in Porto, due to our late arrival from the great train fiasco, today we wanted to change that. Luckily, to get anywhere in this city, you have to trek up some super steep roads or stairs, allowing you to both work up a big appetite, and burn off whatever you just gorged on. We started our morning in Porto by climbing to the top of the city, and stopped on for our requisite morning coffee and pastry at Café Costa, which is what seems to be their version of a Starbucks. 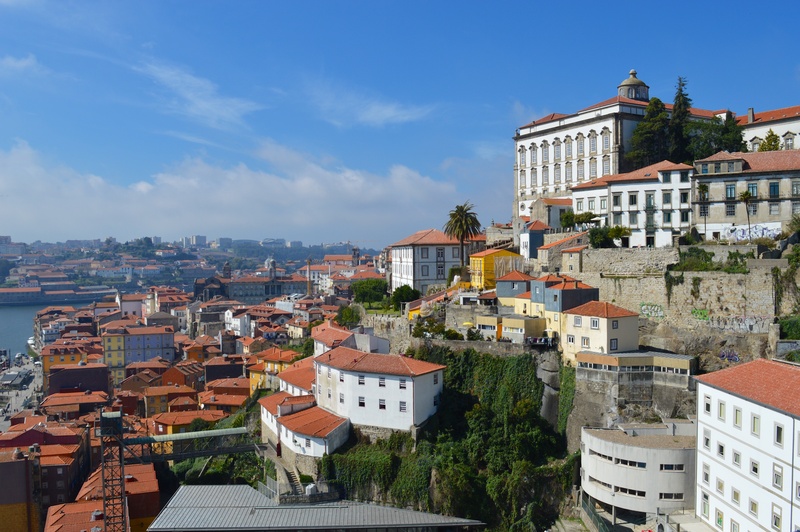 The central focus of this area of the city is definitely the Baroque Igreja do Clérigos (church of the clergymen), which was built in the mid-1700s, and is most well known for its magnificent tower that is the highest point of Porto’s skyline. Like many of the buildings here in Porto, what I find interesting about this church is that it’s so thin, yet still so monumental in presence. Tall and thin seems to be the running theme in Porto architecture. After visiting the church and having our coffee, the tourist in me had to get his fix. I REALLY love bookstores, and old historic bookstores even better. Susete and I once saw a list in the Internet, if the world’s most beautiful bookstores, and we decided that it would be awesome to one day be able to visit as many of those as possible. We’ve already been (several times) to the infamous Shakespeare & Co in Paris, and when we found out Porto had one of the best, we had to go. Livraria Lello e Irmão has become such a tourist attraction, that they now charge a small admission, and have a lineup to get in. 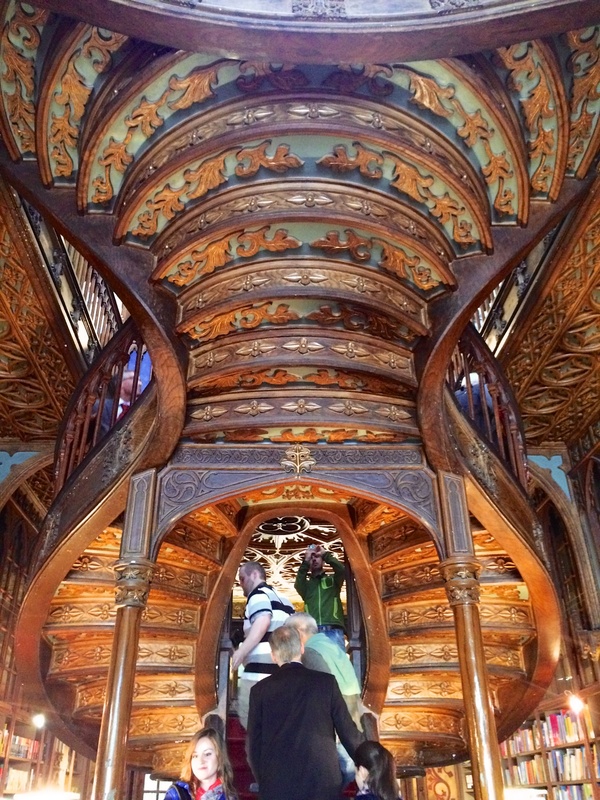 This bookstore is most famous for its beautifully unique staircase which is said to inspire much of the design of Hogwarts from the Harry Potter series. It was while living here in Porto, that authour, J.K. Rowling dreamed up Harry and his counterparts, which is now very evident to me after seeing this iconic bookstore, as well as all the black caped students around Portugal. You can definitely see a lot of the influence she had in her books after witnessing it all in person around this country, and especially here in Porto. As much as I really love this bookstore, so much of its charm and presence was stolen away by the crowding of tourists that make it nearly impossible to enjoy the true atmosphere that is has to offer… on top of that, tourists find it necessary to stop and spend their time ON the staircase, blocking all flow of foot traffic, as well as blocking any view that this beauty has to offer. This kinda ruined the experience for us, as it gave us the feeling of just wanting to get through it and get out. It’s such a shame too, because this is the type of place I could hang on for hours. After all the fighting through your crowds, we were hungry now. 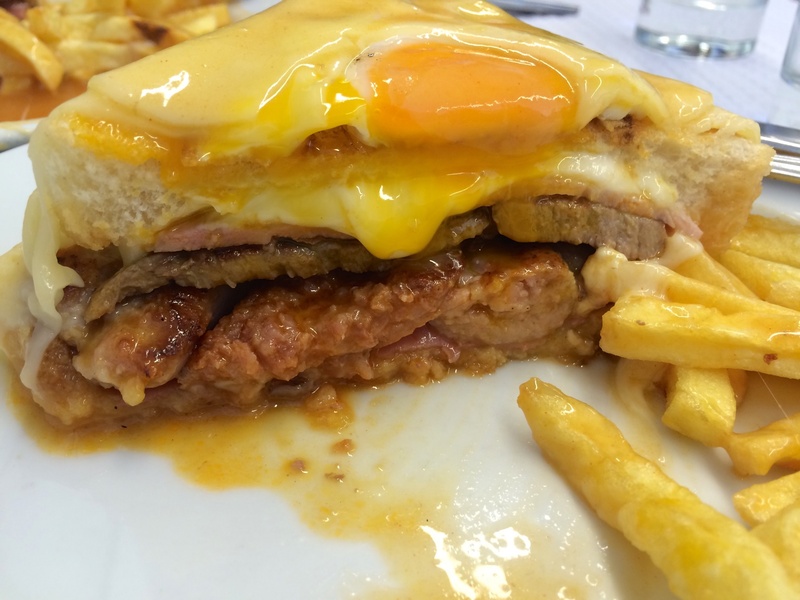 It was time to experience a northern Portuguese icon, Porto’s most well-known gastronomic monstrosity, the francesinha! Oh man, this has got to be the sandwich of all sandwiches. It’s so epic that it must be eaten with utensils rather picked up. Two slices of fresh bread, filled with layers of linguiça sausage, steak, ham, mortadella, and blanketed with a cheese overtop, which then has a secret sauce (more like gravy) poured over it, melting the cheese to embrace the sandwich in its gooey warmth… the sauce making a pool of gravy goodness around the sandwich, which of course, you soak up with the fried potatoes that you eat as well. This time, our version of the sandwich, at Café Santiago, was also topped with an egg fried sunny side up, releasing its yolk into the sandwich as you cut into it. Lucky for us, restraint won out, and we decided to share a portion… which was probably the smartest thing we did all day, as we would’ve been rolling out of there otherwise. It’s scary to think that men & women of all sizes eat this beast all on their own, alongside the fries and a beer to wash it down. How the hell do they fit all that in?! It’s amazing though. This is one of those foods that is so disgusting that it’s just so damn good. I will be bringing a version of this to Toronto…. oh yes, I will. Torontonians be ready! 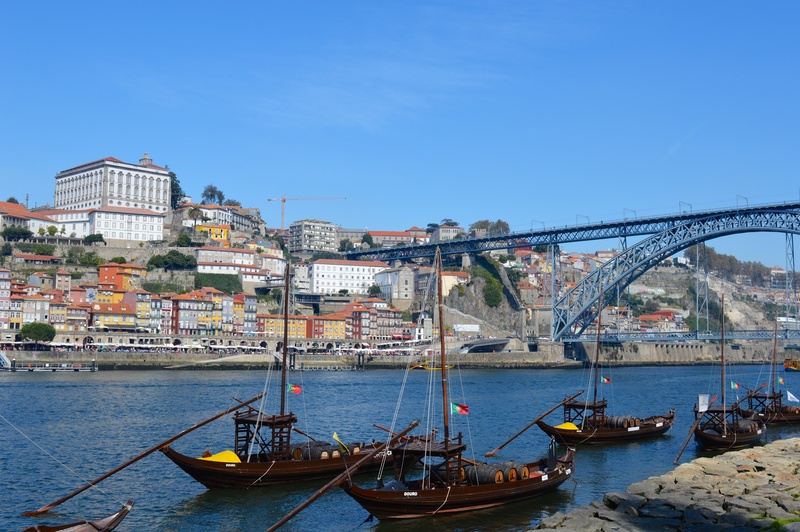 After of monster lunch, we took another walk across the Dom Luis I bridge to catch the fantastic views in the daylight (as we first saw it at night), and then headed downhill to the waterfront at Gaia, to visit some of the port houses. I’m pretty new to the whole drinking thing, so learning about the wines and ports here is information overload and I love it. it’s just so interesting to me, the history and complexity of it all. We cruised (on foot), Avenida Diogo Leite, the main road running along the riverbank in Vila Nova da Gaia, looking for where to go and what to do. We stopped at the most recognizable of the lineup of port houses, Sandeman, with its iconic brand character of “The Don”, with its sombrero, black cape, and glass of port – representing the company’s roots having trade in both Spain (Jerez) and Portugal (Porto) in the fortified wine business. 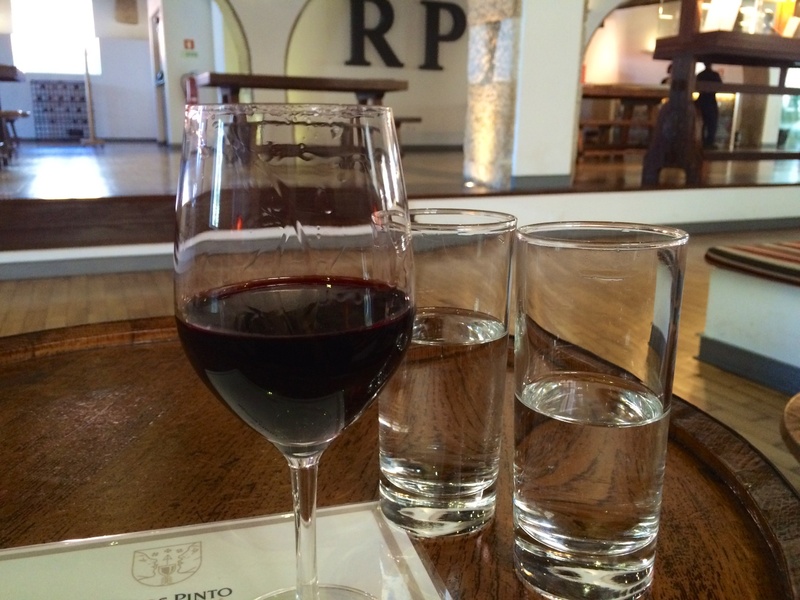 We booked a tour of the cellars, because we’re in the home of Port, so we just had to! Since we had a while until our tour time, we wandered further down the strip to see what else there is. Ramos Pinto was another stop we made, and was much quieter than Sandeman. The tour they offered was at the same time as the tour we already had booked, so we just settled in for a tasting. The first time Susete and I tried port at home, we nearly lost ourselves because the wine tasted like rocket fuel. We swore we’d never drink port again, but now we’re here in Porto, and we had to see if there was a difference drinking the quality stuff. At Ramos, it was our first tasting, and knowing we had a tour coming up at Sandeman (that included a tasting) we went light… we tried the Ramos Pinto 10 yr old tawny. Low and behold, it was good! Our first hellish experience with gasoline port long ago, was washed away, as this higher quality 10 yr old tawny put our minds at ease, realizing that good quality port is actually tastes good and won’t burn your face off. The time for our tour at Sandeman came up, and we claimed our spot amongst the crowd. 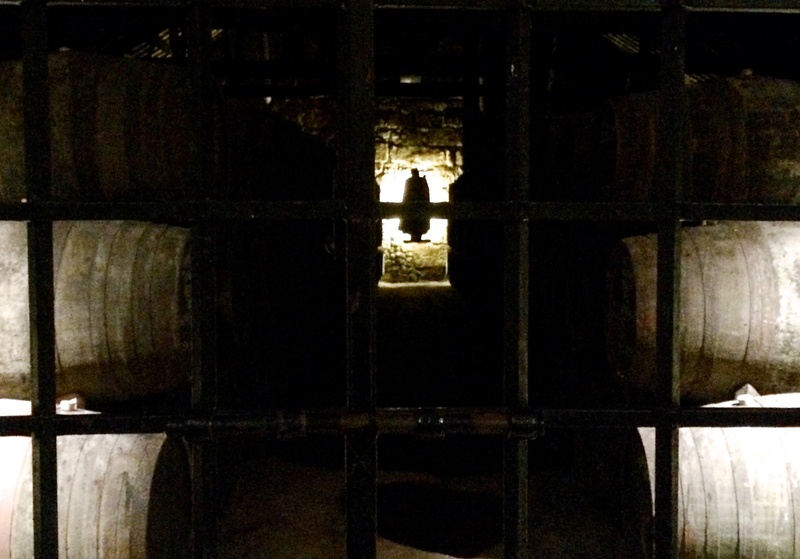 As soon as we entered the cellar area, the smell of aging port wine took over. Seeing all the vats and barrels was really cool, especially knowing that they are actually in use, producing the next batch of Sandeman fine port. I love learning new things, and since most of this was new to me, I was taking in so much information…. or at least trying to, amongst the large crowded group that was making the experience a little bit of a cattle rush. Port wine is divided into two major categories – tawny port, which is aged in smaller oak barrels, which allows for more air contact into the wine, aging it faster and imparting much of the smokey oak characteristics, that also include caramel and spices into the wine. The more pronounced ‘oakiness’ makes tawny a dry port, with the older generations being a much more amber colour. Ruby port is aged inside very large vats, with the large quantity keeping more of the oak characteristics out of the wine, giving Ruby port more fruity, chocolatey flavours. There’s a third category that excels above the other two… that’s the vintages. Almost all vintages are of the Ruby variety, with the major difference being that they are made from single harvests of gapes, unlike the regular ruby and tabbies which are blends. Vintages years only occur about 2-3 times per decade, and are declared by an independent organization that governs the quality of the wines with strict regulations. Port wine can’t be called port unless it’s made with grapes grown in the demarcated Douro valley, and aged in the cellars in Gaia/Porto. The Douro valley is the oldest legally demarcated wine region in the world (Tuscany, Italy and Hungary have older wine growing regions but weren’t officially governed or demarcated until later) and it’s divided into 3 distinct regions, each possessing unique growing climates and conditions. Vintage years can only be declared if all three regions meet the quality standards, and that can only be determined after the wines have been aged for a minimum of 2 years (to see how they’ve survived the fermentation process). This means that a particular year can’t be declared until 2 years after its production, so we’re still waiting to hear if 2014 or 2015 will be vintages. The most recent year to be declared a vintage amongst Douro valley wines was 2011, which is also widely thought to have been the best year of the past century! Of course, from this point on, any wine labeled 2011 has gotten my attention. Regular and reserve tawnies and rubies are meant to drink right away, as their aging is complete due to the blends they use, and can be kept for about 2-3 months after opening, while still possessing the same quality. 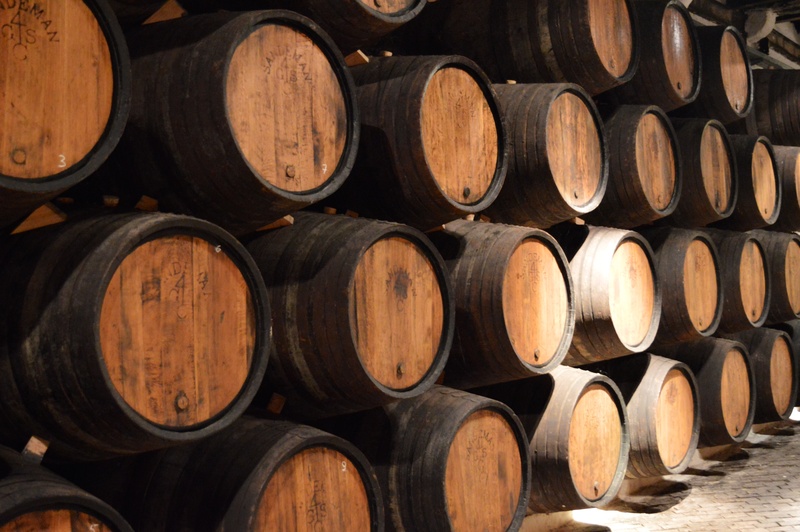 Vintages, however, are meant to be aged, in their unopened bottles, and are generally thought to be the older the better… some ports going back over 200 years old! The only kicker with these old ports are that once you open the bottle, the aging process speeds up rapidly and these have to be consumed within 2 days! Imagine keeping a bottle for more than 50 years and then having to down it all in one or two sittings. Wow. The tasting at Sandeman consisted of 3 different ports, each one with different characteristics, and we found all of them really nice. On our way out, we picked up a Ruby reserve port to bring home, as well as a box of smaller sized bottles of multiple styles for my mom. After the tour we made one last stop in Kopke, which is the oldest of the port houses, had one more tasting and decided to call it a day, as we’ve already had too much to drink for rookie drinkers. Time to stumble back across the river and have a rest before dinner. We’re lucky in the fact that we just happen to have a fabulous restaurant right underneath our apartment. After the day we had so far, we didn’t feel like venturing out too far for dinner, and our apartment host recommended our downstairs neighbour for a good meal. Much of this experience, I described in the intro, but I just have to say that Taberna Mercadores is a truly wonderful place to eat, and is the type of place that would be the envy of many chefs who’ve spent years in the industry. It’s very small, no fuss, simple and charming. Whoever they can fit, they fit. Whatever they happen to get fresh that day, they serve. That’s it. Just simple good food, honest and real. No gimmicks, no bulk ordering, no imported hard to find luxuries. You don’t demand a certain thing, you don’t annoyingly request modifications to the menu. They have specials of the day, you pick one or a few, and you eat it as it’s served, because it’s these people are professionals, and the food is damn good. I think most of us chefs always have an inner yearning for this type of place… to just be able to cook what we feel, from our hearts and souls. No trying to please the yelpers or reviewers, no making sure we never run out. Just honest cooking. By the end of the dinner I was actually offered a job to stay and cook…. Susete looked at me knowing how much of a tug on my heart strings this kind of offer is, but we have big plans for our own place back home, and we aim to bring Portugal to Toronto… the real Portugal. So, the job offer was nice, but it will have to be put aside, while we build our dream restaurant in our home town, which just happens to be one of the best cities in North America to try something different in the food world.